What a game. The Portland Timbers started the match early versus the Sounders at Jeld-Wen Field with a Kris Boyd goal in the 15th minute. Horst would double the score a few minutes later. Seattle's Eddie Johnson rounded out the score at 2-1 in the second half. 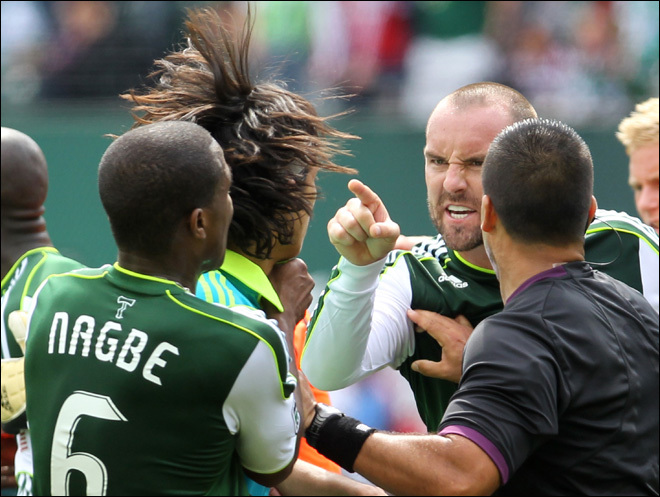 It was a different kind of MLS game: honor, rivalry, and plenty of fighting. This was the Cascadia Clasico, of course, one that dates back several decades to the age of the NASL. The on field rivalry plays off the natural competitiveness of the two cities in the Pacific Northwest. Seattle is the more established, cosmopolitan place while Portland is an alternative, and proudly sustainable city. And this carries on to the teams: the Sounders play at CenturyLink Field, an NFL venue with all the commodities, while Jeld-Wen is solely a soccer field with a distinct "made in Portland" attitude. On the pitch tonight were two squads in dire need of a win. Seattle had been winless in 6 matches, while the Timbers were cellar dwellers in the West. 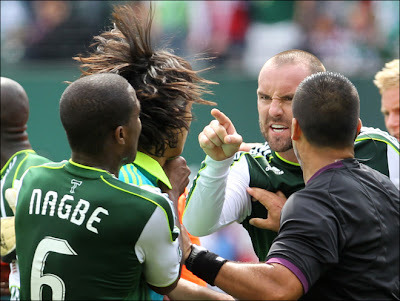 John Spencer, Timbers' coach, has been rumored to be in danger of losing his position. Whether or not this is true, the Scotsman needs to get his team out of the sophomore slump and give the Timbers Army the kind of game they are so passionate about. And yes, Portland delivered. Boyd knew what was at stake, being a son of the Old Firm rivalry between Celtic and Rangers in Glasgow. Nagbe, Al-Hassan, Jewsbury, Chara and Futty remembered last year's loss at home and were looking to avenge it. Along with Palmer and Perkins, however, Jewsbury let the emotions get to him, and Freddy Montero, a proud Sounder, responded with unsportsmanlike conduct. Two red cards and a yellow card. But hey, that's what these games are about. The fact that ESPN chose to air this match immediately after the England - Italy Euro game was brilliant, as it captured a different audience and showed the rest of Americans and the world how seriously the game is taken in the Pacific Northwest. Full stadium, Timber Joey, the Timbers Army, and the whole of Rose City watched their team win while singing proudly "When I root I root for the Timbers!"